One of my fave spots! My living room couch – fire going, cup of tea, yarn near by, my girl busy coloring – heaven. 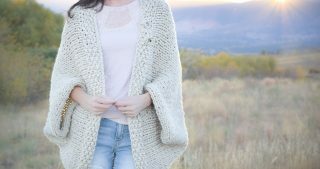 You’ll see more detail about this in the pattern below, but the piece is knit flat and is essentially made up of several rectangles that you’ll seam together. 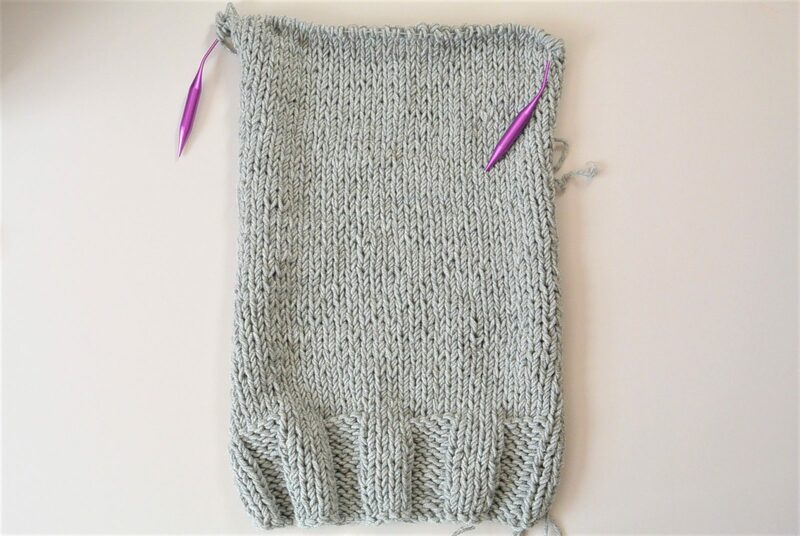 The arms do have a few decreases, but if you know the knit stitch, decreasing is a breeze. You’ve never decreased? Well, rather than putting your needle under one stitch as if you’re going to knit, you put your needle under two stitches, then knit as usual. So easy, right? Honestly, the biggest challenge with this sweater (and many sweaters and projects in my opinion) is the seaming. Seaming can be easy as a simple whip stitch, but it doesn’t mean it will look amazing. I walk you through the seaming options that worked for me so I hope that you find that helpful. Also, note that the seaming does add some bulk but is necessary to keep the pattern as beginner friendly as possible. 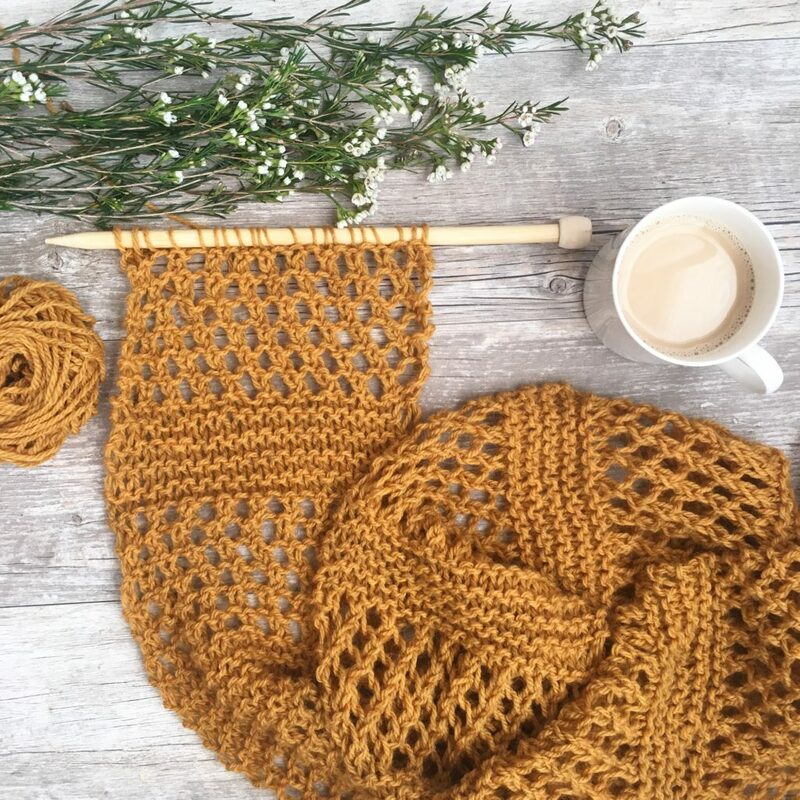 Ready to start knitting? Here we go…. 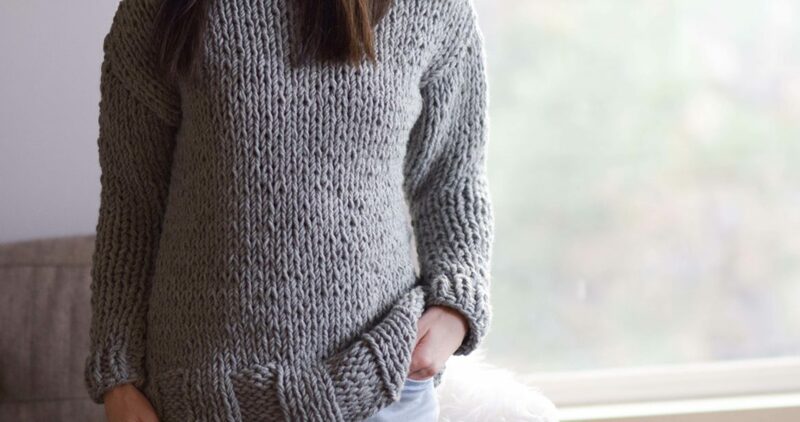 Cold winter days beg for big, cozy knits like this chunky, warm pullover. 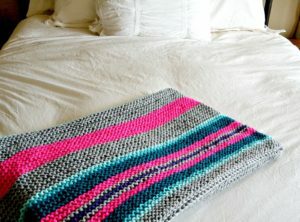 This easy project was created with the beginner in mind as there is minimal shaping and only basic knit stitches. 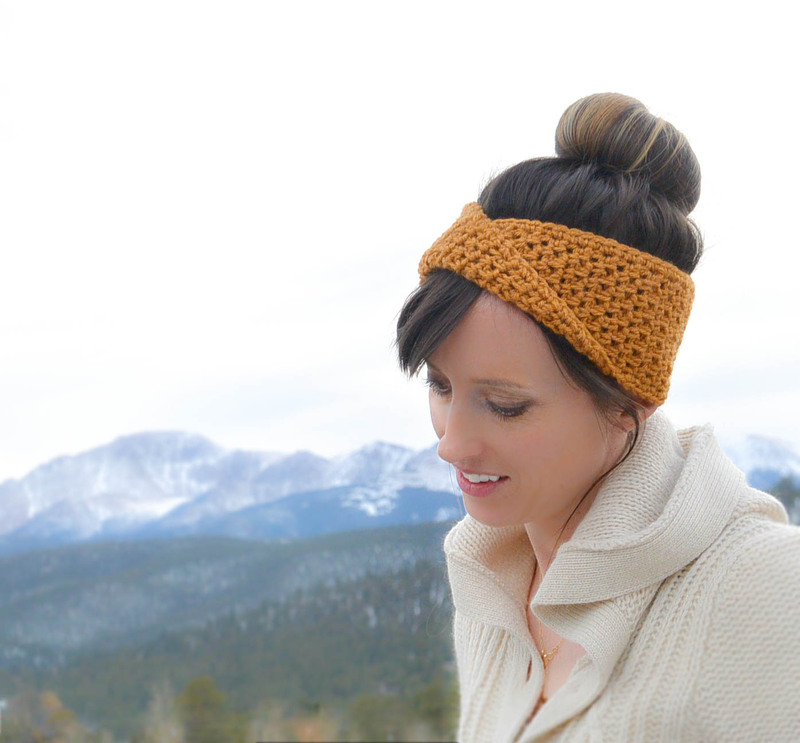 A perfect first time knit sweater or easy project for relaxed knitting time by the fire. Gauge is important in this pattern for sizing to turn out correctly. Also, measure as you go to ensure your widths and lengths are turning out correctly before you finish the entire pullover. See panel measurements in “Main Body” section below. Adjust accordingly. 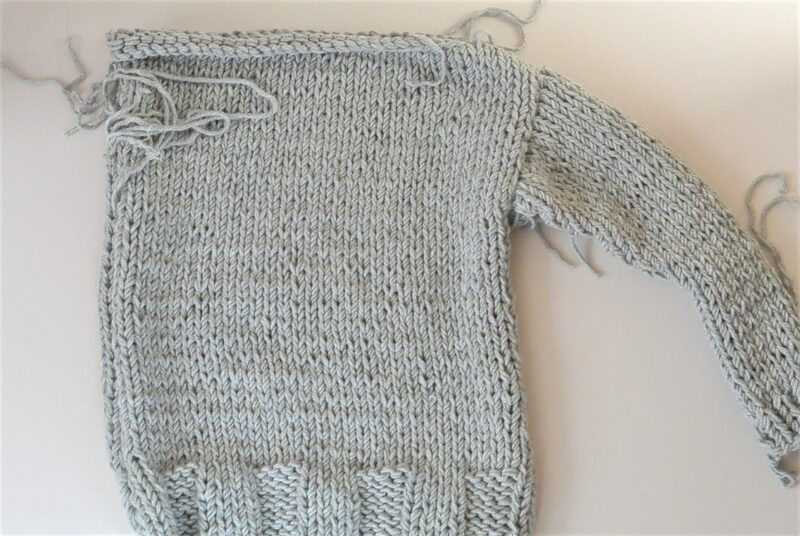 Entire pullover is knit flat while holding two strands of yarn together. 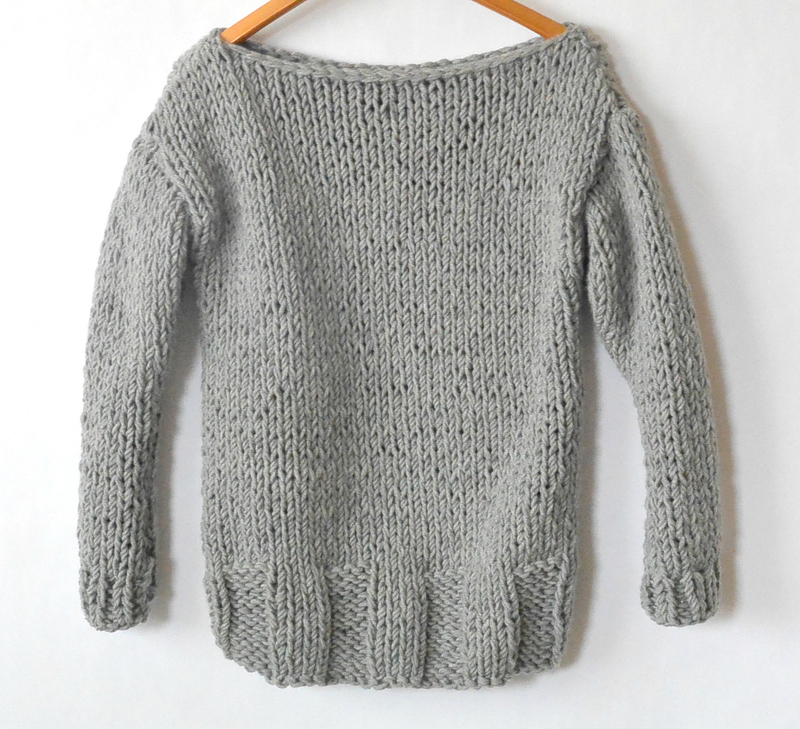 You will knit two rectangular panels for the front and back along with two separate sleeves. All panels and sleeves are then seamed and sewn together to create the sweater! 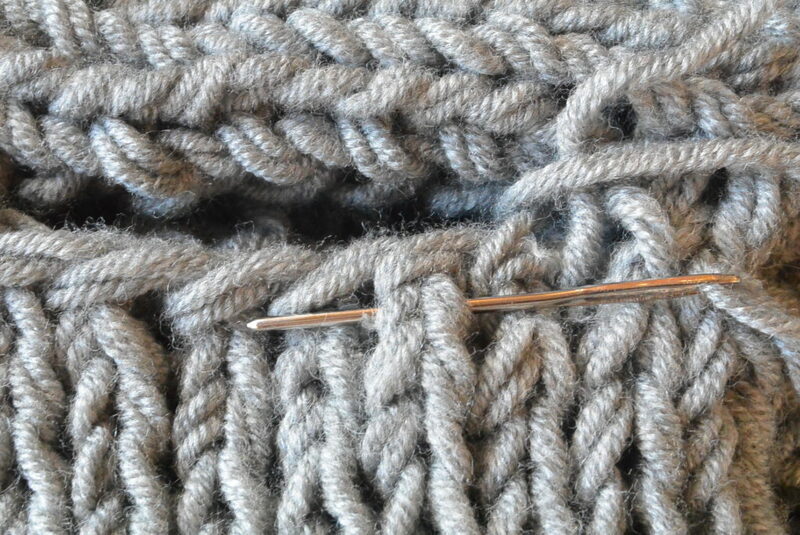 If you know how to knit and purl, you will find the stitch work to be rather easy. There is minimal decreasing on the sleeves which is done by simply knitting two stitches together at indicated points. The fit of the sleeves is slightly snug. 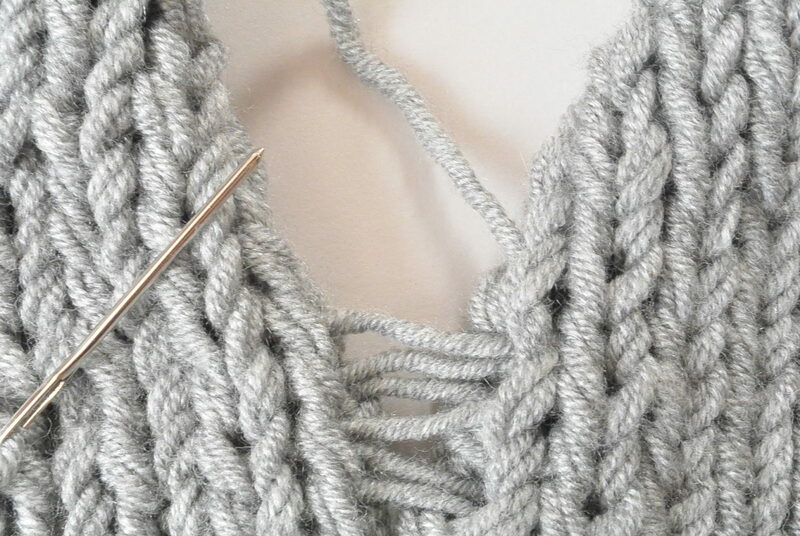 If you’re experienced, you may knit sleeves in the round with appropriate needles to avoid the bulk from a seam. In addition, you may make sleeves wider by adding stitches while keeping an even stitch count. Block as needed. Repeat rows 1 & 2, 5 more times for a total of 12 rows of rib stitch. Repeat row 1 for 11 more rows for a total of 12 rows of rib stitch. Repeat row 1 & 2, working in stockinette stitch until entire piece measures approximately (23.5”, 24.5”, 25.5”, 26.5”) ending on the right side (knit side). Knit cast off, weave in ends. Whip stitch seam or use preferred method to sew the ribbed portion and proceed with mattress stitch up the stockinette portion of the body until you reach the sleeve. Tie off and weave in ends. Seam up each side. Finally, ensure you have tied off and weaved in all loose ends. You can find many tutorials online by doing a search for simple “how to do the mattress stitch”. You will line up your two panels and work back and forth through two rows, pulling your needle and yarn through the “bars” of the stitches. Do not pull too tightly. Pictured below is a mattress seam in progress. When the yarn is tightened, it will create an invisible seam. 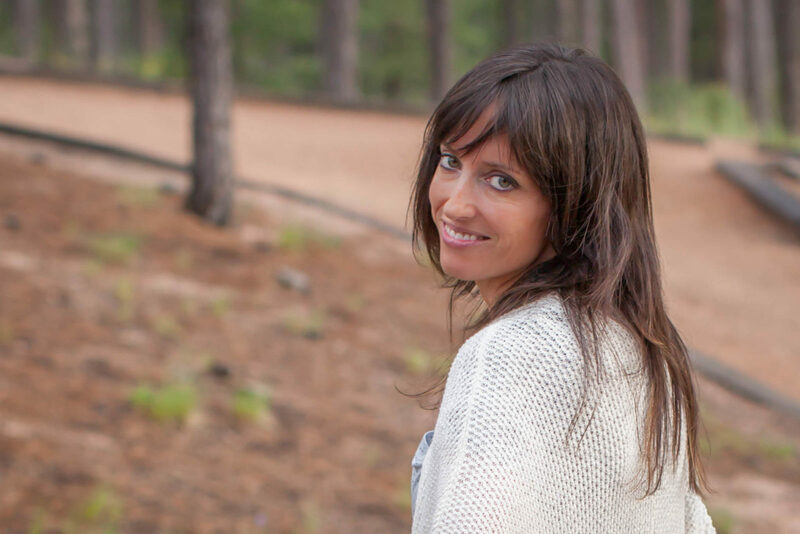 There are a few ways that you may choose to attach the sleeves. The simplest seam is a whip stitch, but this will be quite visible. There are ways to make it virtually invisible if you search online for how to attach selvege edge to cast off edge. I do find these create bulk with our chunky yarn. I preferred to work under the “v” of the stitch on the sleeve (pictured) then whip stitch around the opposite stitch on the main body panel. Above: Working under the “v”, then a simple whip stitch on the opposite side. Continue around. 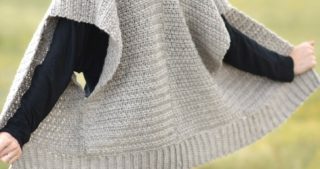 Here, you may whip stitch to keep it simple and not create bulk, or do a stitch similar to the stitch used on the sleeve above where you will work under the “v” on one panel and then whip stitch around a stitch on the other panel. 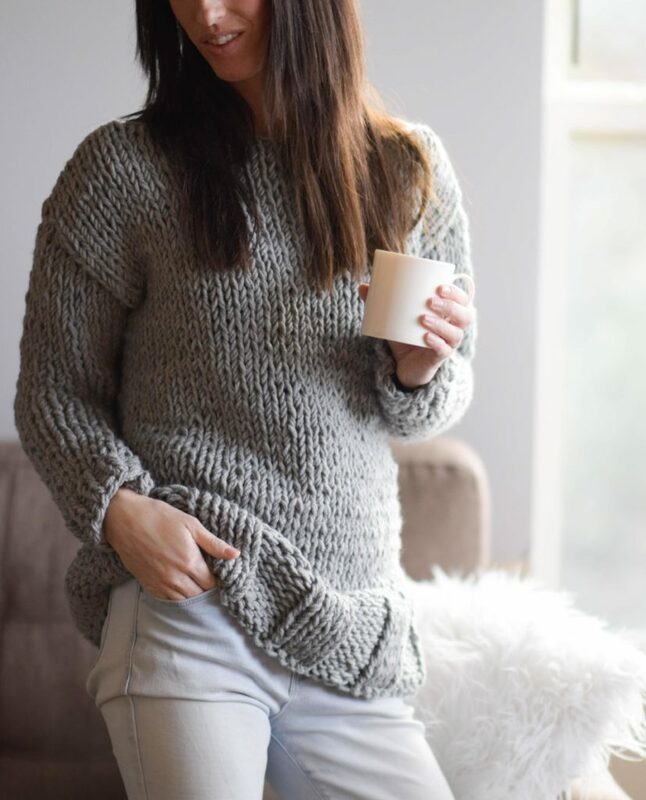 What do you think of this sweater? I’d love to hear in the comments below. Easy enough? 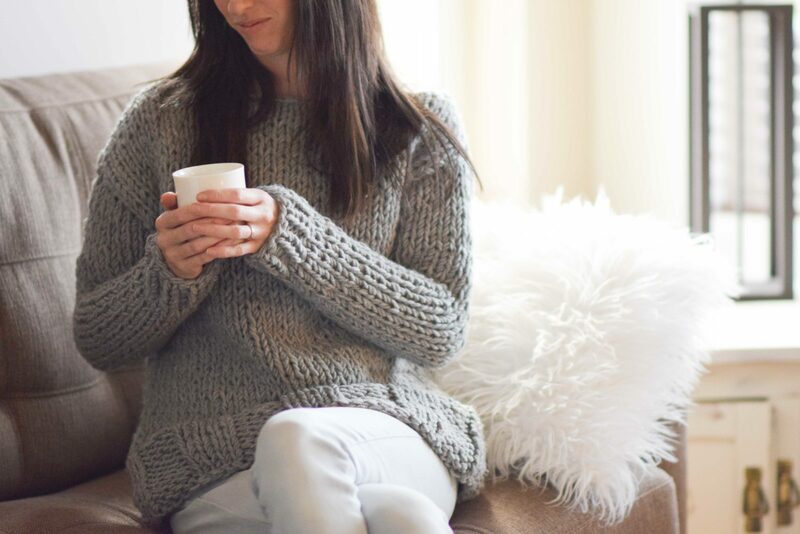 If you crochet, you might want to check out this super easy tutorial and pattern for a crocheted knit-like sweater pullover here! 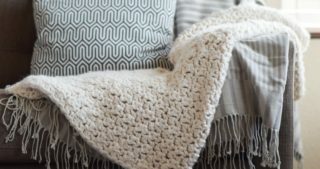 Thank you so much to Lion Brand Yarn for sponsoring this post. All opinions are 100% my own. I like the pattern, but I live in San Diego and wouldn’t use something as bulky. 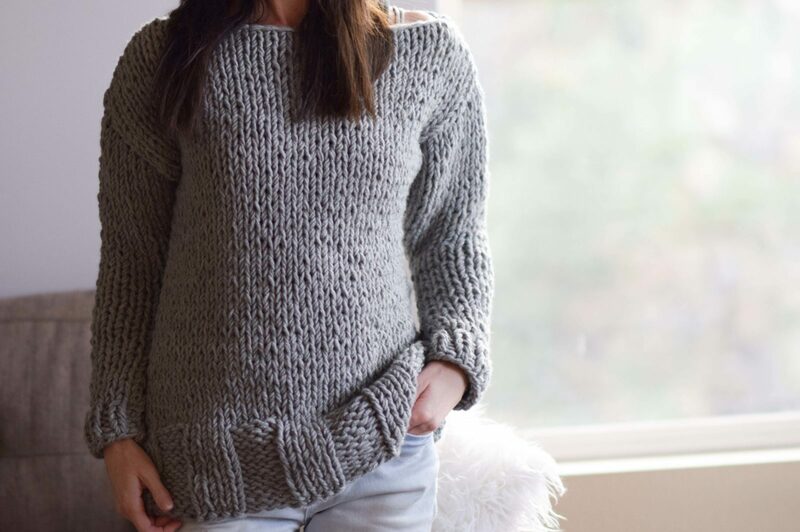 Can you make this sweater using only 1 strand of yarn to make it less heavy? I think that would be beautiful! You may need to play around with the gauge a bit. Make sure your gauge (adjust your tension or needle size to accommodate any necessary adjustments) is similar to mine and you’re good to go. I LOVE this design! Any plans to release a version for knitting in the round? I hate seaming. Thanks so much! So glad you like it. I don’t have a plan to make it in the round but if you’re experienced it would be pretty easy to figure it out from this pattern. It’s written for women’s sizing, so it would definitely be too tight for your boyfriend unfortunately! Do you think its possible to make this with a cowl like neck by picking up stitches once its all seamed together? Or would you do it some other way? I think that would work Nicole! Hi, this looks a lovely jumper and would be great for chilly winters in the UK. 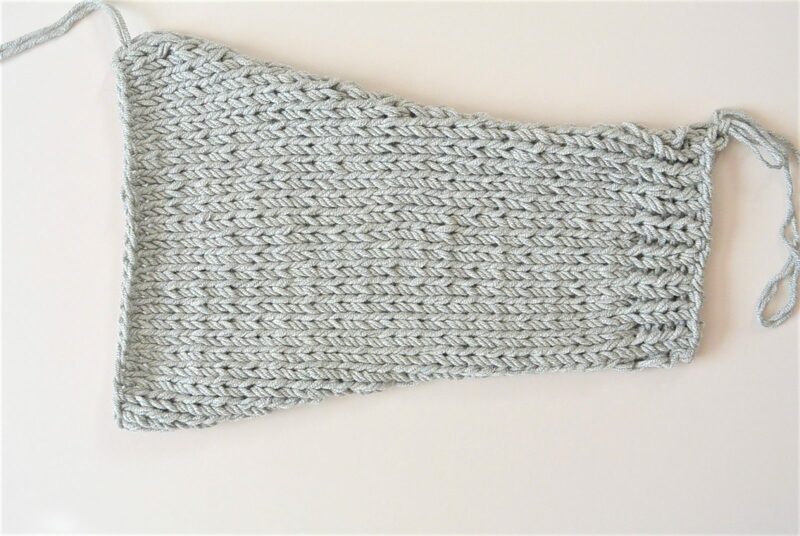 I am a total beginner only having knitted very simple scarves etc. When you say circular needles, can you use straight ones in the sizes you have given? I don’t have any circular needles. The only issue with straight ones is that it might not be possible to hold all of the stitches on one needle. If you are making a small size, it may, but I’m not certain! Years ago I knitted a sweater, this looks like a similar pattern. Thank you for sharing it. I might work on another soon . I just wanted to say thank you for making this pattern so easy. This looks beautiful, I can’t wait to start it! 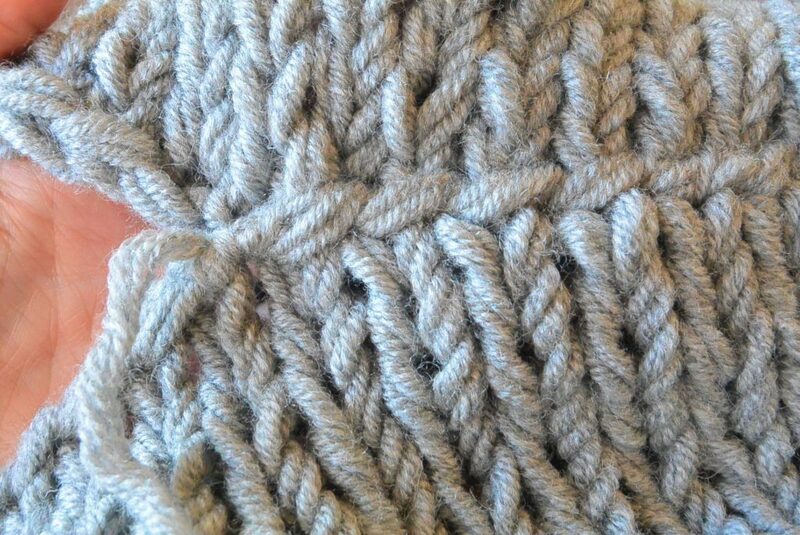 As for seaming, would slip stitch crocheting the seams work as well, vs. mattress stitch? 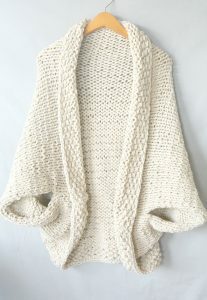 Complete knitting newbie here..what do you mean by front/back panel vs main body? What is the difference? Hi Melinda! Yes, you can use any comparable chunky yarn and I think the chunky Hometown would be a good option. Hi Jessica (& Melinda)! If Hometown or Wool-Ease is used, would you still need to use 2 skeins at once? Hi! I ended up buying the longer circular needles as specified and made the sweater using Lana Grossa 100% Colmo, a virgin wool, alpaca & mohair blend. It turned out great, and as promised was very simple! I just needed to adjust the number of stitches in the body by 4 based on the swatch guage, but given the detailed instructions, felt confident the whole way. Thanks again!! 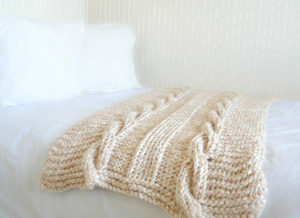 So wondering if I could use a super bulky yarn (I’m thinking “Heal the Wool”). Would I need half the yardage of the Woolspun (which seems to be discontinued anyway)? I don’t want to go by weight as they may differ because of fiber content.